As you might notice this is the 600th issue of The Ask Leo! Newsletter. I can hardly believe it myself. I've been doing this since November 1, 2005. (If you're wondering why the weekly math doesn't quite add up it's because I did twice-weekly issues for a while.) That's over 10 years. Wow. And for the curious, all 600 of 'em are archived over at newsletter.askleo.com. Thanks, as always, for being here. I couldn't do any of this without you. What's Up WIth Microsoft and Email? In the wake of Microsoft's announced withdrawal of support for Outlook.com synchronization with Windows Live Mail 2012, I review some of the implications, including an update to my position on getting free email programs from Microsoft. 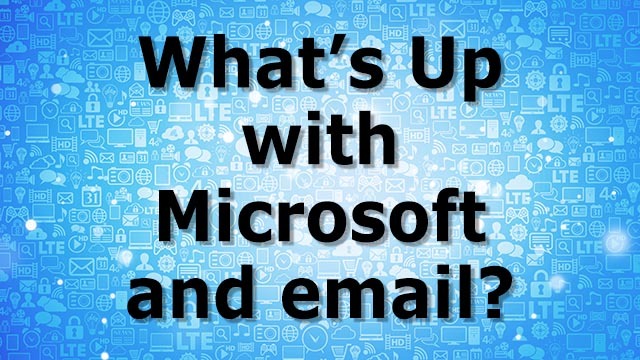 Continue Reading: What's Up WIth Microsoft and Email? Backing up is kind of like eating healthier: everyone knows we should, and few of us actually do. Much like the heart attack victim who no longer binges on french fries, when it comes to backing up, the most religious are those who've been bitten hard by a failure in their past. Asking what backup program to use is very much like asking, "What's the best exercise program?" The best program for exercise – or backup – is whichever one you'll actually do. In order to choose what's going to work best for you, there are several questions to ask. Continue Reading: What Backup Program Should I Use? Why would an exploit not be caught or detected by my antivirus program (Avast) or Malwarebytes (running in the background)? If not detectable, how much "damage" can the exploit actually do if users follow prudent operating precautions? Would System Restore be usable if infected? I have also followed your advice and routinely image my Dell laptop. We need to clear up a little terminology, but your question is a very good one: how can malware get past anti-malware programs to infect the software installed on your machine? Is the attached really true and how can I keep all my emails in hotmail on my PC and work with those when I am off line? I also store all my emails on my PC in WLM as well as have many groups created for my bulk mail-outs. That's just one of several questions that arrived recently in response to Microsoft's announcement that their Windows Live Mail 2012 desktop email program would no longer support Outlook.com-based email accounts, including email addresses at hotmail.com, outlook.com, msn.com, live.com, and more. Naturally, this took a lot of people by surprise. As it turns out, the dire warnings, while certainly significant, may not be entirely accurate. And, of course, the warnings fail to mention some very viable alternatives that don't involve Microsoft. An animated GIF is file format that contains a sequence of individual images in a single GIF file that are intended to be displayed in sequence over time. The result is that an animated GIF can be used to contain short videos and animations. Animated GIFs are often used in place of traditional video file formats when the animation is short and sound is not required, as GIFs have no sound capability. The video sequence is often played automatically by most GIF-displaying software, which can also be instructed to loop the video a specified number of times, or infinitely. To take this a little further, I'll add that most people have little understanding about the extent to which they're tracked. You've got companies collecting social data and aggregating it with financial information, purchase history records obtained via customer loyalty programs as well as numerous other data points/sources (search: data brokers). You've got companies tracking you across whatever devices you use, irrespective of your cookie/privacy/telemetry settings (search: probabilistic cross-device tracking). You've got companies tracking you in a whole bunch of other ways - some overt, some covert. And all of this happens in what is very much a legal grey area with little legislative control or oversight. You've got no idea which companies track you, no idea what data they hold about you, no control what they do with that data and no ability to correct inaccuracies. Currently, this tracking is predominantly used for the purpose of serving up targeted advertising, which probably isn't too much of a problem is many peoples' eyes (mine included). However, it can be used for other purposes too. Online retailers already use demographics/profiles in order to adjust pricing on a per-customer basis (the price you see may not be the same as the price that I see). Travel comparison sites have even been found to display higher prices to Mac users (Mac users have a higher average income than Windows users, so are likely to be willing to pay more). Target used purchase history records - of things like calcium, magnesium, unscented moisturizers and charcoal-flavored ice cream - to work out which customers were pregnant (search: Target pregnancy). How much longer before picking up a friend's anti-cancer meds - and putting it on your CVS loyalty card - starts affecting your life insurance premiums? There have even been instances of data brokers selling information to criminals who subsequently used it to fraudulently withdraw millions of dollars from peoples' bank accounts (search: FTC vs LeapLab). Of course, it's not all doom and gloom. Data collection/big data has the potential to be enormously beneficial. Never before have we had access to so much data about people on such a massive scale, and that data can certainly be put to good use. For example, aggregating the data from fitness tracking devices - such as Fitbits - with social and socioeconomic data pulled from other sources could provide us with an unprecedented level of insight into how a wide range of issues affect our health and wellness. As Spider-Man once said, 'With big data comes big responsibility' (okay, maybe that's not exactly what he said, but it's nonetheless true). Many people spend a lot of time on keyword research, or worrying about keyword research. While it's important, the best keyword research is already right in front of you. Whether or not to date your posts can quickly turn into a religious argument. I'll review the reasons to date your posts, and the reasons not to, and the overriding theme to keep in mind when making the decision.